Pre-orders include soundtracks and bonus DLC. 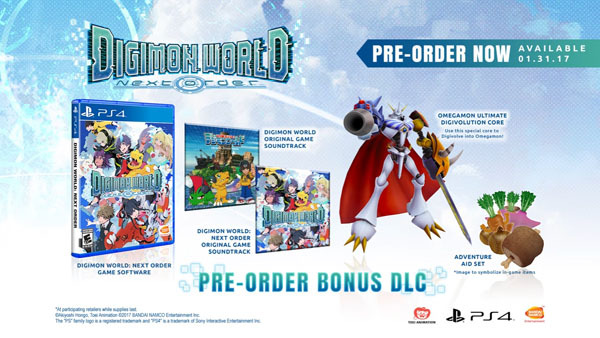 Digimon World: Next Order will launch for PlayStation 4 in North America on January 31, 2017 and in Europe on January 27, Bandai Namco announced. “Omnimon Ultimate Digivolution Core” DLC – Use this special core to digivolve one of your Digimon partners into Ominmon. In Europe, Bandai Namco has launched an interactive activity on Facebook called Digi’Hunt. It tasks users with tracking down QR codes hidden on the official website, on screenshots, trailers, and so on to unveil a secret code and get a chance to win prizes. This activity will run until the launch of the game. Watch a new story trailer below. If you missed it earlier today, view a new set of screenshots, as well as the game’s updated box art, at the gallery.